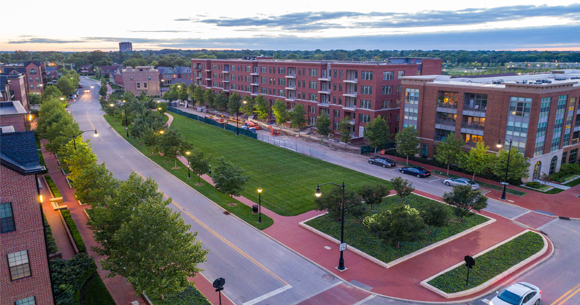 Parks Edge Condominiums are currently under development and accepting new contracts in Columbus’ Arena District. Parks Edge West began the project with a 12-story, 69-unit condominium building and has expanded to Parks Edge East, the second phase currently under construction. Both offer parking garage access, breathtaking views of the downtown skyline and river, and access to the rooftop swimming pool. 828 at the Yard Condominiums are currently slated to finish development in the Fall and accepting contracts in Grandview Heights. 828 at the Yard is a five story, 35-unit building which includes access to The Yard Club amenities building. Sales are underway at Parks Edge East with residents moving into Parks Edge West. The community features 15 diverse floor plans with a mix of one-two-and-three-bedroom residences ranging from 1,500-3,200 square feet. Pricing for the 15 standard floor plans range from $427,000 to $1,345,000. Floor plans can also be customized or combined to exceed the 3,200 square feet and $1,345,000. A high-end condominium development located in the exciting mixed-use neighborhood of Grandview Yard, in Grandview Heights, Ohio. This five-building, 36-unit waterfront community is adjacent to the newly renovated Cannonsport Marina with convenient access to Palm Beach County shops, restaurants, museums and attractions. Located on Lake Worth inlet just 55 miles to West End, Grand Bahama Island, the marina offers a fully stocked ship's store, water hook up, wireless internet, fuel dock, and boat slips with dockage up to 125'.